Home »Comics»Deadshirt is Reading: Mister Miracle, Redlands, and more! 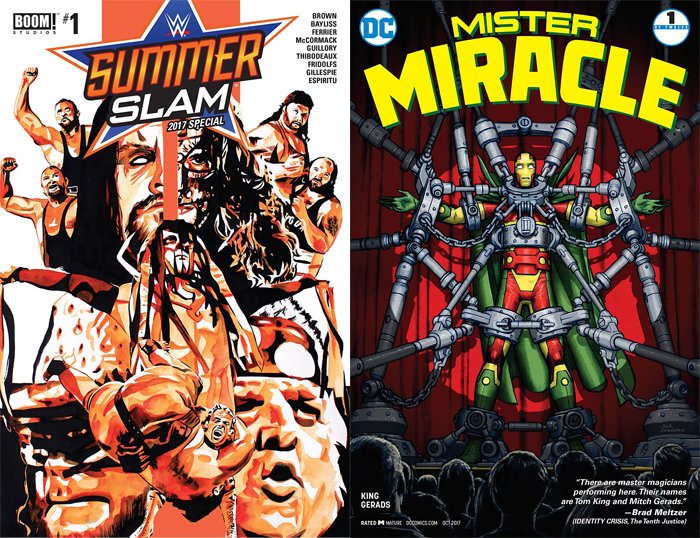 Good comic book stories based on the lives of professional wrestlers have been a little few and far between, especially ones that submit to the zany characters and gimmicks found within WWE’s immense history. Enter BOOM! Studios into the ring dishing out some high concept stories that treat kayfabe (that’s wrestling slang for the script) as reality. This week is a nice anthology book providing background and context to iconic matches of WWE SummerSlams past. There are five stories in this issue, each centering on a specific wrestler, match, or tag team across WWE’s major eras. The first story starts out strong, centering on Dusty “The American Dream” Rhodes’ match against Randy “The Macho King” Savage from SummerSlam ’90. Dusty here is presented as a hero of the common man as opposed to Macho’s self-aggrandizing personality. Macho is lifted to the ring by an army of muscle-bound dudes, including one devoted fan who is promptly derided by the wrestling tyrant. But in the ring, Dusty, whilst in a headlock, receives the strength of the crowd chanting him to victory, including the same fan who previously was treated badly by The Macho King. It’s a great story full of heart and serves as a nice memorial to the late, great Daddy Rhodes. The second story is probably my favorite of the bunch because it’s about my favorite wrestling feud of all time: Mick “Mankind” Foley and The Undertaker. The comic retells the build-up to their match at SummerSlam ’96 where Undertaker’s manager Paul Bearer turns on him and joins Mankind. It’s a dark story mostly featuring Mankind in a boiler room rambling to himself…or is it to some darker force? Ferrier absolutely nails everything from the unhinged mind of Mankind and flamboyant speech of Paul Bearer, whereas McCormack and Cunniffe’s colors and lighting make the supernatural elements of the story come alive. The last scene of Undertaker being led away by hooded men after his defeat had me in chills. The last three stories of the issue aren’t anything to write home about but are still modestly decent. The New Day story is Part 5 of a continuing story so I was a bit lost, but Guillory’s Saturday morning cartoon art definitely fits that team’s aesthetic. The fourth story is a Disney Adventures-esque comic centering on The Bushwhackers and a few fun moments with some of the wackiest WWE stables. The last story is decent but a slight repeat of the main WWE comic book story centering on Seth Rollins and Finn Balor. If you’re a wrestling fan, I highly suggest giving this book a go. Nothing says “ambitious DC Comics title” like adhering to a nine panel grid, huh? Easy jab aside, Mister Miracle #1 is the most exciting thing anyone’s tried to do with Kirby’s Fourth World since Morrison’s work on Final Crisis. Bringing Miracle, his wife Barda and the rest of Kirby’s pantheon into the post-Rebirth universe proper without heavily relying on any other titles makes it an easy read for the uninitiated, but what confusion there may be about the mythos or the plot feels intentional, setting up an obtuse, but compelling mystery to drive this 12 issue maxi-series forward. The premise is pretty straightforward: master escape artist Scott Free has attempted to commit suicide, ostensibly to see if he could escape Death. The events of this first issue unfold at a curious pace, challenging a linear understanding of the proceedings and focusing the reader’s attention more on mood, theme and style than basic plot mechanics. The purposeful uncertainty surrounding Scott’s world helps bond the reader with Scott, who struggles to reconcile his new reality outside of the hospital with the one he knew before the incident. The cliffhanger opens up the possibility that things are only going to get wilder and more epic from here, but this kernel at the center of the chaos makes for a great hook, before the larger cast makes their obligatory appearances. King and Gerads maintain an easy chemistry that makes for a cohesive, striking experience right out of the gate. Gerads’ linework and its attention to detail/realism help brings the epic scale of Apokolips and New Genesis kicking and screaming into slice of life frames, like watching a mega budget blockbuster lensed by Gus Van Sant. King’s writing plays with this imagery well, uses bombastic, old school narrative captions juxtaposed with incongruously dark panels. The chasm between that carnival barker authorial voice (perfectly captured by Cowles’s lettering) and the sullen morass Scott’s life has become seems darkly comedic on one page and cruelly maudlin the next. These creative touches telegraph the lofty aims the storytellers are reaching for in the macro, but make for truly captivating pages here in this first installment. Anyone seeking out their modern fix on the Fourth World won’t be disappointed, but for a haunting snapshot of the persistent, depressive mood of 2017, where our own world’s equivalent of the Anti-Life Equation already got a reality star elected President, few mainstreams books are plumbing these omnipresent depths so shrewdly. Whether or not the finished series, wrapped up in a trade paperback bow, will be able to stand shoulder to shoulder with the lauded classics that inspired it remains to be seen. But from this first salvo, it’s hard to argue against going along for the ride to find out. A solid piece of advice often offered to new writers is “start as close to the end as possible.” The Redlands creative team either took that advice too seriously or missed it entirely, and it’s telling that I can’t decipher which one. Redlands has a fantastic idea, but spends an entire issue telling a story that only should have taken a few pages. It’s a solid idea for issues two or three, but it’s a bad fit as a first issue. At its core, Redlands is about a group of modern witches in the titular town of Redlands, Florida. The implication is that they’re almost more feared for being women than being supernatural. The whole comic shows the aftermath of the police attempting to lynch the witches, who then proceed to terrorize the police station. That’s the whole issue, by the way—we learn about how a few of the cops interact, and we learn how they’re Bad Cops and how they hate the witches, but there’s a distinct lack of substance. Some of this falls within normal comic parameters—too much real estate on the page and not enough dialogue to move the story forward is a problem comics have been dealing with for years—but it still feels like there should be more. I also get that Redlands is going for small town horror, but the entire issue takes place solely in the police station. They did a great—and remarkably subtle at times—job making it clear the police in this town were misogynist and racist; the use of a Confederate battle flag in the background is a great touch that’s never addressed in dialogue but is effective just the same. One of my biggest problems is that by the end of the issue, I’m not quite sure who to root for. I had little sympathy for the police, but the witches are clearly set to be the monsters of the series. Instead of leaving me curious, it left me confused. This is why wrestling doesn’t do heel vs. heel matches that often—even if their motivation is different, it makes it hard to pull for one side over the other. I also didn’t find the violence that shocking, but that may be a byproduct of growing up on 2edgy4me Vertigo comics. I imagine they’d resonate a lot more with newer fans to the horror genre. Even though the writing fell flat, my criticism doesn’t extend to the art. Del Rey’s art is cluttered in the best way. There’s a lot that goes into each panel, and the details are clear and add a sense of history to each location. Bellaire’s coloring, while occasionally a little dark for my liking, is divine, and each figure pops in just the right way. It lets the reader feel the overbearing heat of the fire, and sense the unnatural aspects floating in the dark. I want to like this more than I do, but atmosphere and good art can only get you so far. At some point there needs to be more of a story and less issue-spanning prologue. It almost feels like this wasn’t written just for one issue consumption but specifically as the opening to a trade—maybe it’ll work better there. For now, I was just left wanting more, but not in the way intended. 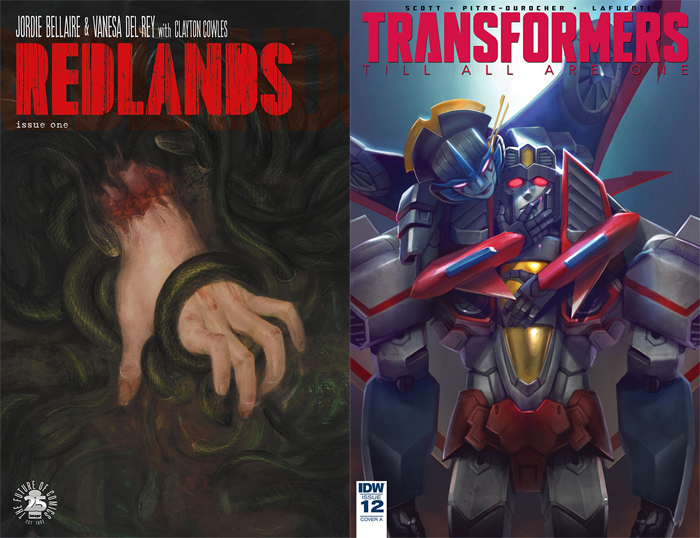 There are clear signs that IDW’s Habro/Transformers venture has successfully become a real Comics Universe. It’s impossible to follow within a budget without using a wiki, every summer the books grind to a halt for a new event, and some of the most beloved books bite the dust before their time. This is the last issue of Scott and Pitre-Durocher’s Till All Are One, which actually continues a story that has been going over two previous limited series (both entitled Windblade). While there will be an annual this winter to wrap up the series, this is still the last issue of the ongoing, and it suffers for having to shoulder those expectations. 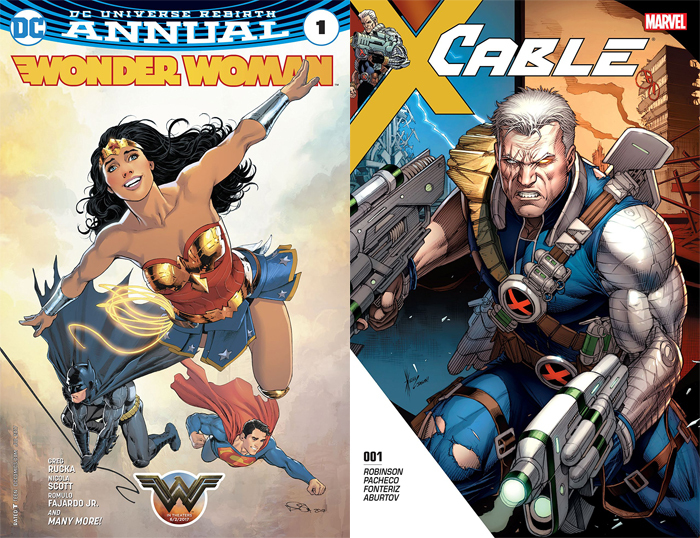 This issue will disappoint you if you want resolution on any of the ongoing plots of the book, and the series thus far has dipped quite a bit into the political thriller well, so there are plenty. Issue #12 serves only to resolve the current arc. Where the payoffs happen is LITERALLY within the main characters themselves. Starscream and Windblade, the two giant robots that are the closest things the book has to proper leads, are trapped in each other’s mind trying to defeat a third, even bigger giant robot mind. And of course, dream worlds always give artists room to play around in, and Pitre-Durocher and Lafuente do not disappoint. The team provides dynamic action and several sharp new character designs that are not so showy as to take away from Pitre-Durocher’s real strength, which is facial expression and selling dialogue with just the visuals. These books have some of the best body language in comics. The internal conflicts for Windblade are all put to rest here, and Starscream, a character that will continue to be dissected in-fiction for decades to come, has been given an inventive new turning point, all without giving any real external resolution. It’s a real inventive take on growth inside an ongoing universe, but now the deck is stacked against an annual to deliver over three years of conclusions.